pas not immediately made public. 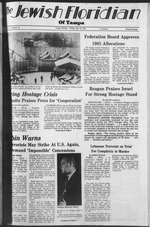 American hostages released in Beirut June 30.
to combat and ultimately eliminate this scourge." prize ... freedom and justice." the suicide of the perpetrator. tremists. One woman was killed. his arrest in Lyon last October. wounded on March 26, 1984. To Be A gjr Anwrion? tion and the Arab-Jewish conflict. the Carter Center located there. casion of the Bicentennial in 1976.
stormy period in our nation's life. ment after an unprecedented eight-year tour of duty in Israel. Nothing artificial to get in the way of flavor! Eiecutiva Editor r- <111< . per year is deducted from their contributions for a subscription to the paper Anyone wishing ic. will be Day Care, from 7:30 a.m.
feeling ill after playing tennis.
. ,-, slow-learner." His resent*!! line, his heart is a little liehter. children a sense of identity. youngsters of this city "roots"
have children in this age group. tuous thoughts of years gone by. eight week wait." she was told. What i8 it that once wa,. July 20,6:30 to 10:30 p.m.
the internationally known PAUL BRASLOW. | Starling Fine Art Is otherwise by appointment or Invitation only. 102 W. Whiting St., 2nd Fir. daughter. Ellen, to Glenn Tobin. Mildred and Harry Michelson together again. her husband, Harry, back to St.
and forth as often as possible. vances among friends and family. Social Services, or Edward W.
crafts, bowling and many . of your talents with the Men. tion at the dining tables. ready to offer informative ""
tiveness and the Jewish wo"
to support productive, flourishing communities." Anna Neuwirth. 87, of 3001 DeLeon St..
1000 Lbs., up to 45,000 Lbs. who may be potential members. Aug. 28; and Thursday, Sept. 5.
the home of Judy Tawil (207 S.
meetings, please let us know. ding an invitation to you all. Tune in "The Jewish Sound" WMNF 88.5-FM, 10:30 a.m.1 p.m.
JCC Lunch Bunch, 10 a.m. Kol Ami Senior Socialites, noon. Tune in "The Jewish Sound" WMNF 88.5-FM, 10:30 a.m.-l p.m.
B'nai B'rith North Tampa Board meeting, 8 p.m.
yet for your pre-schooler this fall? must be three by April 1, 1986.
classroom one day each month. 7:30 a.m.-6 p.m. Ages: 2-4.
you can help us out. point of Jewish activity in Tampa. the incoming board of directors. children. We must build now. plans for a "Wellness Program." public relations in the community. ty .. can always be improved. Grow Come Grow With Us."